Maybe you love literature or hope to write the next great American novel and have chosen (or are thinking of choosing) English as your major. You, and perhaps your parents, are probably wondering just what your career options are as an English major. There is a myriad of possibilities, just ask your college career or alumni office for a list of alumni who were English majors, and you will be amazed by the diversity of options pursued by graduates with an English degree. As an English major, you’ll develop a core set of competencies which can be readily applied in the work world. Obviously, English majors learn to convey written messages in a clear and coherent way. As part of this process, they learn to take a position (like a thesis statement in an essay) and make an argument that supports the assertion. English majors are taught to proofread, edit, and refine written pieces until they are well polished. They learn to give and take constructive criticism since papers are often reviewed by peers in the classroom setting. English majors read and digest massive amounts of content each week. They’re able to pick out major concepts and discern flaws in arguments. They must learn to manage their schedule well in order to complete the time-consuming reading and writing tasks assigned to them on time. Learning to understand and appreciate different perspectives as they attempt to understand the approach taken by various authors and classmates is another valuable skill learned as an English major. They learn that there are typically many different ways to approach a problem. English majors often have a creative flair that enables them to compose poems, stories, and essays as well as to conjure up a unique interpretation of a piece of literature. Explaining perspectives and presenting information verbally to others is also a critical part of the educational process for English majors. Since your major is only one aspect of your personal make up, other values, interests, and skills should be carefully assessed before making a final career decision. However, here are some common careers for English majors to consider as you ponder your future. Social Media Managers need the kind of creativity possessed by English majors to devise strategies to promote an organization through social media outlets. Often, they develop written proposals regarding their strategies for other staff and managers to consider and must explain their ideas to colleagues in order to draw consensus. Social media managers often need to choose bloggers and content developers with whom to affiliate, and they need to manage these relationships. 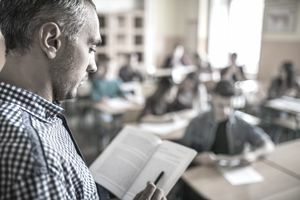 The critical reading skills of an English major can help them to select quality writers and provide constructive feedback to these individuals. The time management skills of the English major help the social media manager to juggle the many different projects which are typically coordinated within that role. New graduates will often start out as assistants supporting the efforts of social media, public relations and marketing managers. Pursue on-campus roles with social media for student organizations or administrative offices at your college. Become an active blogger and promote your blog to attract an audience. Technical Writers compose manuals, frequently asked questions, help sections of websites, and other documentation regarding the use of products and services. They tap the ability of English majors to use precise language to explain ideas in the clearest and simplest manner. Technical Writers need to solicit and incorporate feedback as they revise documentation based on user experiences just like English majors do when revising their essays based on the criticisms of faculty and classmates. Public Relations Specialists need to tell a compelling story about a client or colleague which will capture the attention of the media and generate placement with a magazine, newspaper, website, television or radio station. English majors have developed a refined sense for storytelling and have the creativity and writing skills to convey these messages through press releases. Organizational skills critical to managing the English major's extensive reading/writing workload are essential for public relations representatives as they plan events and address the needs of multiple constituents. Ask an attorney to reference their most critical skills, and it won't take long for them to mention writing as a core skill. Lawyers compose contracts, memos, legal documentation, and courtroom arguments. The writing skills of English majors, and their ability to carefully construct language and position them to excel in these aspects of legal work. Writing may be even more essential to the success of law students as they continually draft arguments about legal cases and precedents. Law students also use the volume reading skills that English majors develop in order wade through the extensive legal texts and articles which are assigned. In order to pass the bar exam, law students must also craft well-written answers to essay questions. Grant Writers are also storytellers since they must explain to funding agents in a convincing manner how resources will positively impact their constituents. They often review, edit, and modify submissions from scientists and faculty as part of the grant development process. Research and reading skills are essential to grant writers as they investigate funding sources and review projects which have been funded by target organizations over time. The artistic sensibilities of many English majors favor them in situations where they are generating funding for organizations in the realms of art and culture. Librarians can tap the English major's ability to appreciate good literature as they consider which books to incorporate into their collection. Reading skills help them to quickly read book reviews as they decide upon selections. English majors learn how to tap resources as they compile information for papers and librarians spend considerable time guiding patrons regarding the best sources for their research projects. The detail orientation and organizational skills of the English major help librarians to set up efficient systems for cataloging and shelving books. Editors must have the critical eye of the English major as they review submissions for magazine and book publishers. They provide critical notes and directives for revisions to writers. Content managers and online editors need to evaluate the writing ability of potential contributors, often freelance writers, and provide feedback and direction. Editors, like English majors, must know their audience and plan for communications which will appeal to their readers. They must be able to set and abide by deadlines in order to produce publications on schedule. Human Resources Specialists utilize language very precisely and carefully as they draft employment policies for organizations. They coach managers about written communications to employees about performance. Human resources managers compose advertisements for jobs in order to attract the most qualified candidates. They develop written training materials for staff development. Human resource managers need the critical reading skills of the English major when reviewing resumes, employee evaluations, language for contracts, and proposals for expanding staffing. English majors develop a solid command for the English language including grammar as well as vocabulary. They are very well positioned to pursue graduate work and qualify as an ESL instructor domestically in the public school system or at a college. In addition, English majors are recruited as English teachers directly out of college by international language organizations including the Peace Corps as well as language schools abroad. Opportunities are especially abundant in Asia where governments in Japan, China, and other countries are committed to teaching their citizens to speak English in order to compete in the world economy. Fundraisers must be able to engage prospective donors, assess their interests, and devise written communications which have the best chance of generating contributions. Development staff write content for brochures and websites and compose campaign letters. They draft language for volunteers to use with telephone fundraising. Fundraisers draft letters of appreciation and articles recognizing the contributions of donors. Fundraisers, like English majors, must be well organized, and detail oriented in order to plan successful events and cater to the needs of those in attendance.